This post has been contributed by Dr Triona Fitton, who has recently published a monograph on the hidden history of philanthropy at the University of Kent. Triona blogs about her research here, and will be speaking at this year’s ARNOVA conference in Chicago. The universities of the 1960s started out exceptionally short on books and other library resources. They were especially sensitive to the fact that this set them back behind the long-established ancient and Red Brick universities in Britain and their vast, distinguished and often donated collections. The first University of Kent library was housed one mile away from the campus, above a shop on Station Road West near to the Canterbury city walls. No provision was available for a library building at the time, so the library remained at that site until October 1964, when the need for further space for the library collection necessitated some resources relocating back up the hill to a hut on Beverley Farm. The first Librarian at the University was a man called G.S. Darlow, himself a philanthropic donor to the University (a cup bearing his name and years of service sits in the silverstore of Eliot College, a gift from the librarian when he left in 1977). Darlow recorded in his first report in January 1964 that, in addition to those purchased by the University, over 3,000 books had been donated to his catalogue. By 1970, donated books had risen to a formidable total of 36,638 – one fifth of the entire library collection. 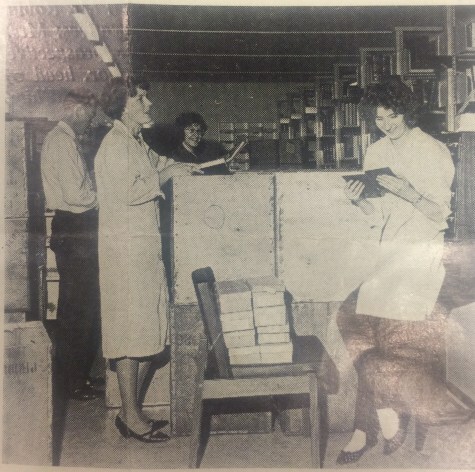 An early appeal was made through the Kent Messenger Newspaper and through that over 12,000 volumes were collected by the arrival of the first intake in 1965. Many volumes came from early benefactors, including Pfizer; from the Sponsors of the University, such as Lord Cornwallis, and from the first members of staff and early recipients of honorary doctorates such as Bonamy Dobrée. Other early library donations of note include volumes from the Labour Party library, the French Foreign Office, London Transport, the Navy League, United Africa Company, Wye College (with whom Kent would later collaborate to host courses in the Medway area); even three of Kent’s fellow 1960s universities, Lancaster, Sussex and Essex, donated small collections of books to the library. Unpacking books arriving at the University Library, late 1960s. However, perhaps the most esteemed donations to the University library were in the form of collections, including the T.S. Eliot Collection (given in part by Bonamy Dobrée, including some with inscriptions from Eliot himself), the Darwin Collection (given by Maidstone donor Jack Johns, a collector of books on evolutionary theory and biology), the Weatherill papers (some of which were given by Lord Weatherill himself, including many personal correspondence), the Melville Collection (given by Andrew Melville III’s widow Joan, featuring documents that span over 100 years of the Melville family’s theatrical history) and the John Crowe collection (a collection of Shakespearean texts that formed the basis for the University of Kent’s Special Collections archive back in the 1970s), among others. The first Templeman library opened in 1968. It has continued to grow and and is currently undergoing a £12 million extension and a £10 million refurbishment. The early philanthropic gifts may well get forgotten as the library grows and far exceeds the University’s early plan for it to house 1 million books and room for 2,500 people to study. But these first books-in-kind – and the benefactors who gave them – are remembered here as part of the philanthropic groundwork of the University of Kent.